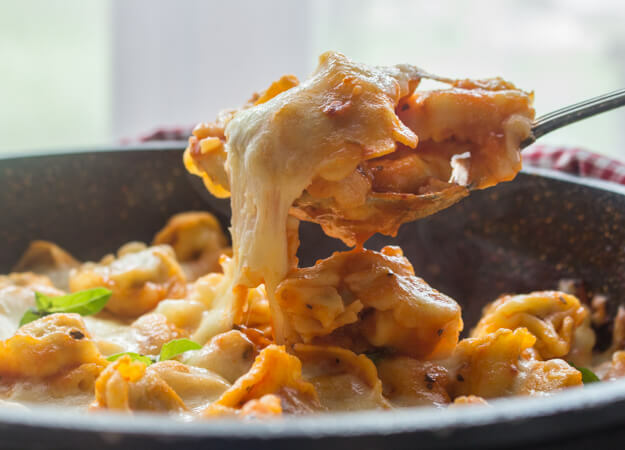 This Easy Homemade Simple Sauce Cheesy Baked Tortellini, is the perfect anytime Dinner. Fast and Simple, a Delicious Family Meal. Well yes one of my worst nightmares has come true, the Italian has been told by his Doctor that he has to cut back on his carbs. Which of course means less pasta, because we all know the Italian believe it or not would rather give up pasta then bread. Crazy I know. As he said “my wife is going to suffer more than I am”! Sad but true. How I loved our almost daily pasta dishes which will now become once or twice a week, because why make pasta just for me? Well I could, but I won’t! So for our (or my) last hurrah I thought why not go all out with one of my favourite stuffed pastas. Tortellini! I usually go for the meat Tortellini when I make a simple sauce. And who doesn’t love a Yummy Cheesy Pasta Dish? 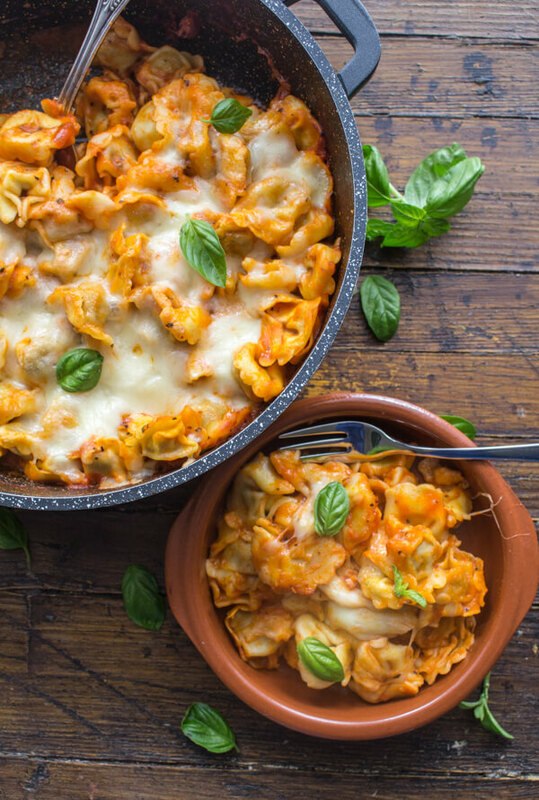 These “Pasta al Forno” Baked Pasta Dishes are some of our favourites. White Sauce Gnocchi is not only a really quick and easy Dish to make but out of this world Delicious. 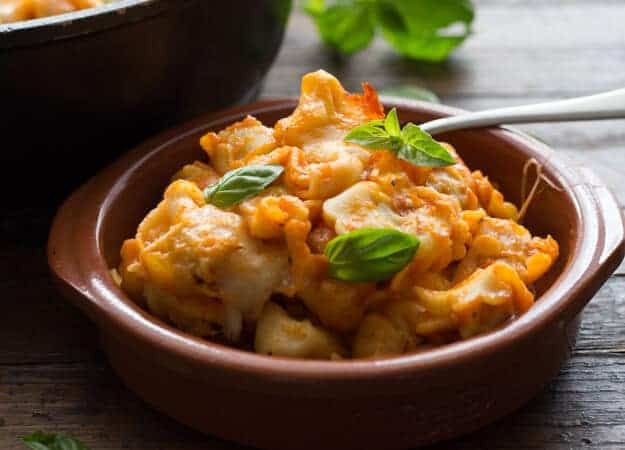 But if a Red Sauce is more to your liking this Simple Sauce Cheesy Baked Tortellini is just what you are looking for. A lightly spiced sauce coats this amazing Italian Pasta. The sauce only takes about 20 minutes to cook and thicken, so while it is cooking you can boil your water and cook your pasta, of course to al dente. Pasta should always have a bite to it, never a melt in your mouth mess. Once both are ready all you have to do is toss them together. To save dishes I actually made the sauce in an oven prove baking dish. Sprinkle with grated firm Mozzarella and Parmesan and broil for about 3-5 minutes just to let the cheese melt and the top to become a little golden. Let it sit for a couple of minutes and then serve. Buon Appetito! A simple homemade Tomato Sauce makes this Easy Cheesy Baked Tortellini Casserole, a new Family Favorite Pasta dish. 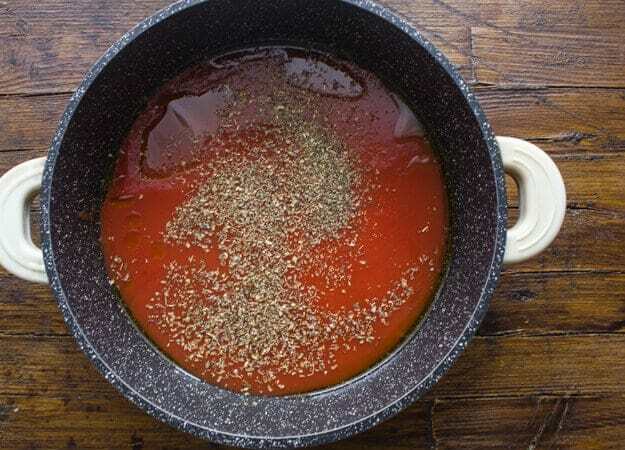 In a medium to large oven proof baking dish add olive oil, garlic, puree, water, and spices, bring to a boil then simmer (half covered) for approximately 15-20 or until thickened. Stirring occasionally. While sauce is cooking boil water, add salt and cook tortellini al dente. Drain. Add tortellini to cooked sauce and gently combine. Top with grated Mozzarella and sprinkle with Parmesan cheese. Place under broiler for approximately 2-3 minutes or until cheese melts and top is golden. Let sit 2-3 minutes and serve. Enjoy! Wonderful recipe as they all are. 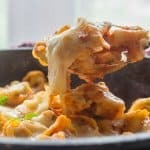 Would you consider sharing your meat filled Tortellini recipe? Please? Thanks so much Elaine, I would love to share it in the near future. Have a great week. Looks DIVINE, and sooooo easy! I’ll be making it this week. I’d like to use 1/2C red wine in the sauce in lieu of water. That should work, yes? LOVE all your great recipes . . every one I’ve tried has been a huge success. Grazie! Hi D. sounds good to me the red wine! Let me know how it turns out. And so glad you enjoy my recipes. Have a wonderful Sunday.